The Go Wild climb is our beginner waterfall climb. 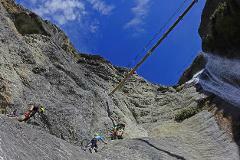 There is some exposure but the climb mostly follows less steep canyon walls. If you can climb a ladder, you can Go Wild. Having completed the Go Wild section, we'll climb higher, into steeper sections of the waterfall. We'll cross two more suspension bridges including a 3-wire bridge before finishing at the base of a spectacular 60m waterfall. 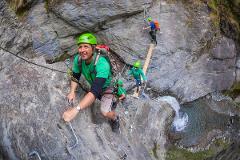 Climb the highest waterfall via ferrata in the world! Our advanced climb, designed for experienced adventurers. 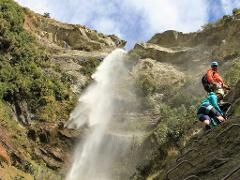 Climb behind a waterfall, through spectacular vertical cliffs and finish by helicopter.